It’s not hard to love Zion Williamson, the 6-8 power forward for the Duke Men’s basketball team has not only stormed college basketball this year, but the teenager is a level 5 hurricane. Why is it so easy to love Zion? it’s because he’s the new human highlight reel of athleticism, high-flying, rim rattling dunks and LeBron-type “where’d he come from?”-blocks, and he also plays the game with effort, passion humility and team defense. Those familiar with Zion from his high school highlights that showed up on our Facebook and Instagram feeds the last couple years knew he’d make a name for himself in college, but no one knew he’d be this big. Not even Zion himself. And with all that press and coverage and top 10 highlights on Sportscenter, there’s no doubt that he’s making hundreds of thousands of new fans a day. Where can I buy a Zion Williamson Merchandise? 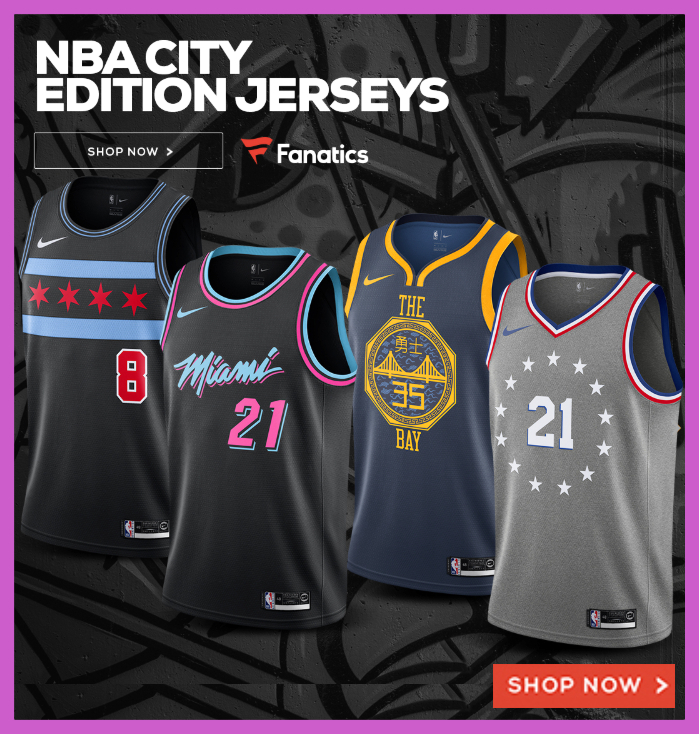 With Zion’s fan base growing exponentially, there’s no doubt that there’s a huge market for those looking to show their fandom for the college basketball superstar in the form of basketball gear — sans the exploding basketball kicks. 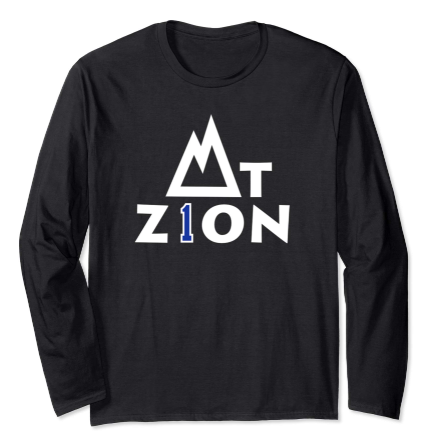 Here’s a well-designed, simple and minimal t-shirt from Teepublic that can easily and casually shows your support for not only Zion Williamson but also Duke. Featured in heather gray below, it simply says ZION across the chest of the shirt with the Duke Blue Devil logo as the “O” in ZION. Easy. 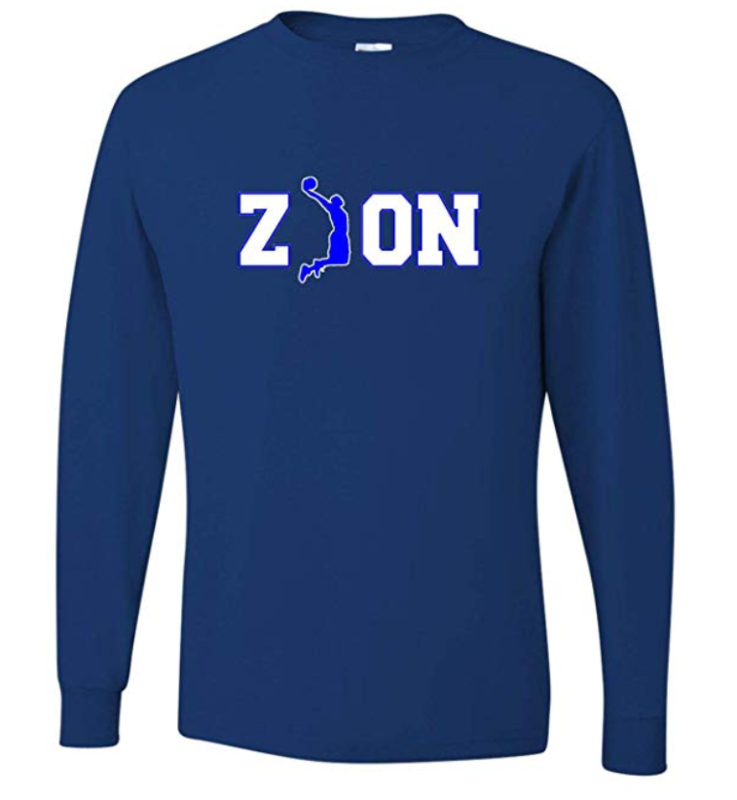 This simple ZION shirt comes in an unsimple (not a real word) 25 different color options. if you have a hard time deciding which color you want to go with, we recommend going with the heather gray as it’s the most-popular and gray is timeless from a college athletics POV. Shop teepublic. Here’s a Zion Williamson shirt from Teepublic featuring the future #1 draft pick in his signature about to throw down a tomahawk dunk pose. 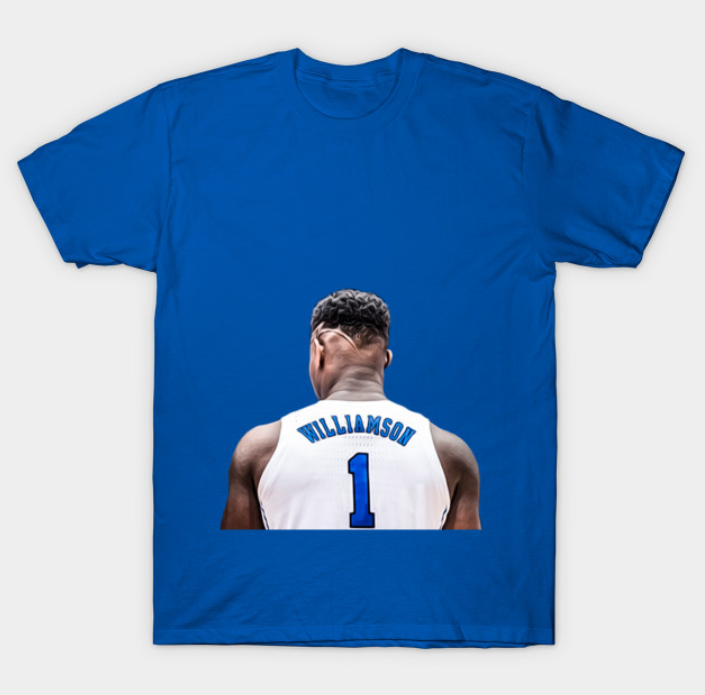 Amazingly this shirt’s only $20 and you can get this Williamson t-shirt in 27 different colors including in Duke colors of blue, white, and black. Duke used to be known as a college for having great college players that rarely-ever panned out in the NBA. That’s not the case any longer. Duke and Coach K now have an embarrassing luxury of five-star recruits coming in every year. 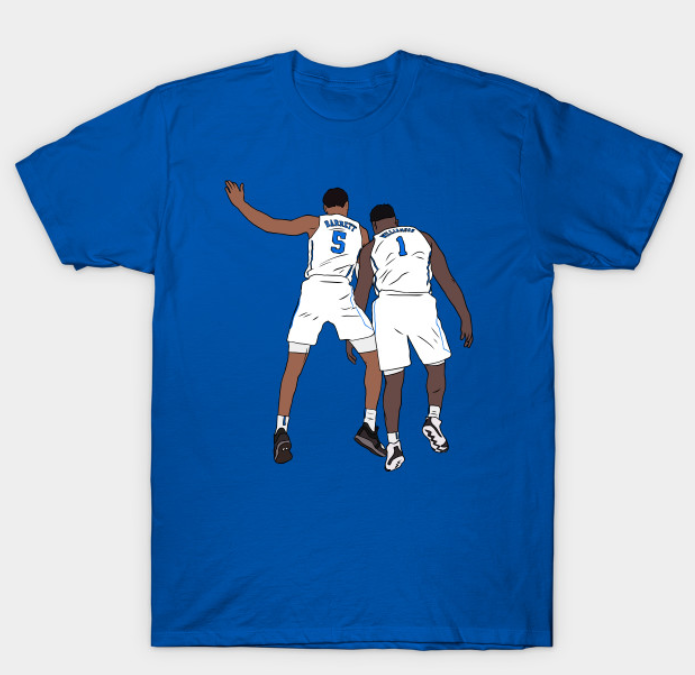 Get the t-shirt of their two top Freshman recruits Williamson and R.J. Barrett celebrating one of their exciting plays. We love this shirt because it’s a lighthearted moment between the two future NBA players. This year, no doubt these two players are leaders for the #1 seeded Blue Devils. As ridiculous as it is to have both these high school superstars (as well as Cam Reddish) joining them this year, the amount of colors this is available is also ridiculous — 27 available colors. Customize your R.J. Barrett and Zion Williamson t-shirt. 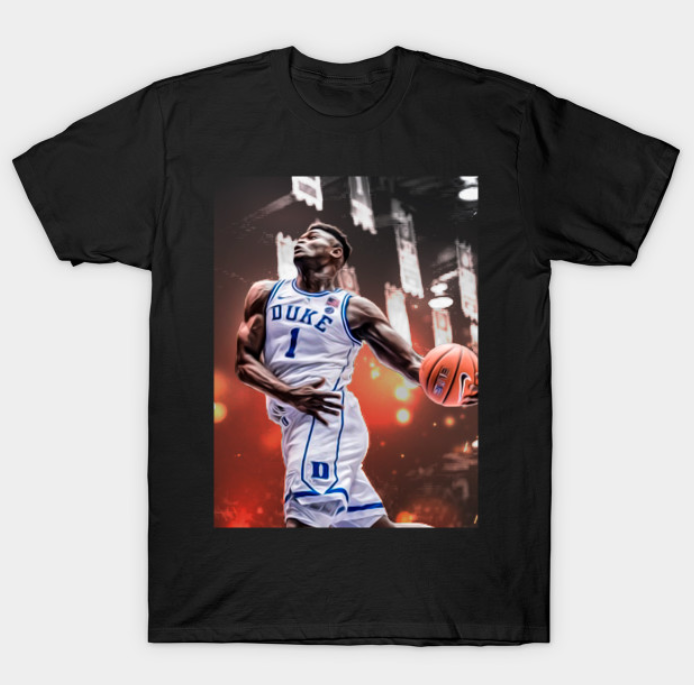 We love this Zion Williamson shirt from Teepublic featuring the back of Zion’s jersey with his broad shoulders and long last name on what looks to be his Duke college jersey. What we really love about this shirt is the style in that the Zion image is set low for a cool street style. Like other shirts from Teepublic, the t-shirt is just $20 and you can get this in 27 available colors. For this particular shirt style, we suggest buying this in one size larger than your normal fit and rock it over-sized. This simple shirt has a dangerous saying. With a big giant “Z” in Duke font, there’s a “Killers Kill” quote from Zion Williamson when he was asked about his game mentality. The t-shirt is called “Killer Z” for good reason. That should be Zion’s nickname. 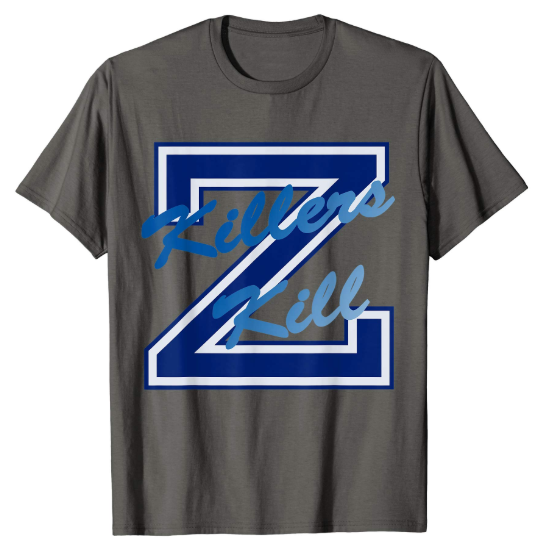 This 100% Zion t-shirt comes in four different colors and blends eather Grey: 90% Cotton, 10% Polyester; All Other Heathers: 50% Cotton, 50% Polyester and shows off Williamson’s recent quote where he said “Killers kill” in response to a question about how he approaches the game. Say no more. Let’s get real here, this t-shirt features what looks like an actual photo of the Duke superstar halfway through a windmill tomahawk slam dunk. Available in over two dozen colors, you can get this in Duke’s traditional colors or one of your favorite colors. It’s extremely easy to personalize. To buy this shirt from Teepublic, click here. From a realistic Zion shirt to a undoubtedly cartoon shirt of the power forward. 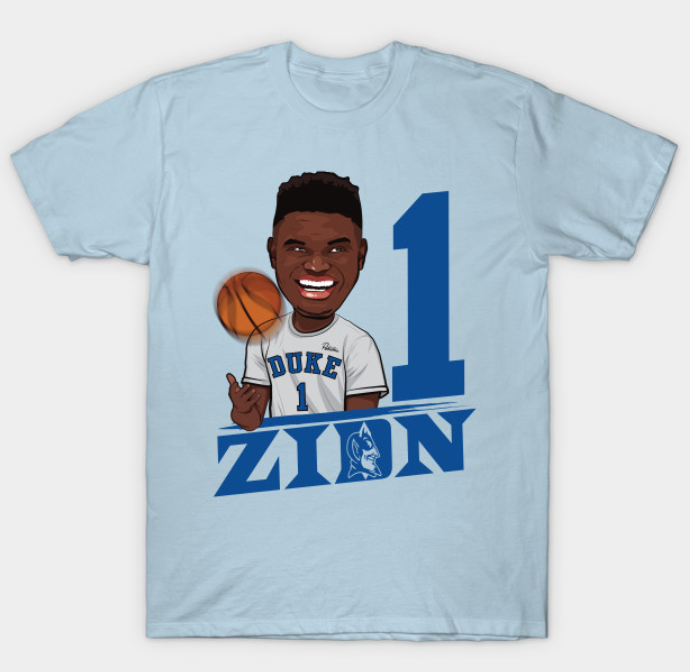 This Teepublic t-shirt features Zion in cartoon form smiling and his #1 both on his shirt that he’s wearing (how meta) as well as it printed large next to him. Unlike the shirts above this, this t-shirt comes in six colors. We love this shirt in light blue (featured above), but it also comes in white, heather gray, charcoal, navy heather and blue. With half a dozen color options, it’s easy to customize to your tastes. To buy this shirt from Teepublic, click here. 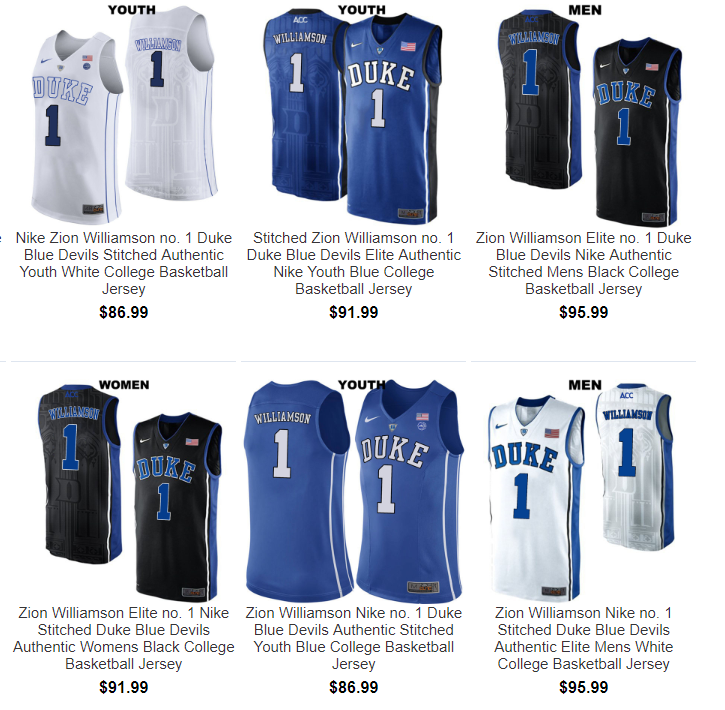 Finding t-shirts featuring the Duke superstar wasn’t that hard, but locating a Zion Williamson jersey selection wasn’t easy. There’s just a not of different options other than buying from Duke’s official store, or getting used jerseys from Poshmark. There are other options for a Zion Duke jersey, but one could never tell if it was authentic or not. As of the date of this post, we say stick with buying Zion’s Nike Duke Blue Devil’s jersey from the Duke Basketball Shop, that way you can ensure that it’s officially licensed and authentic. The jerseys come in all the Duke colors of blue, white, and black. Were you one of the thousands of fans that were following Zion Williamson since his high school days in Spartanburg, South Carolina? Well then this shirt is for you. 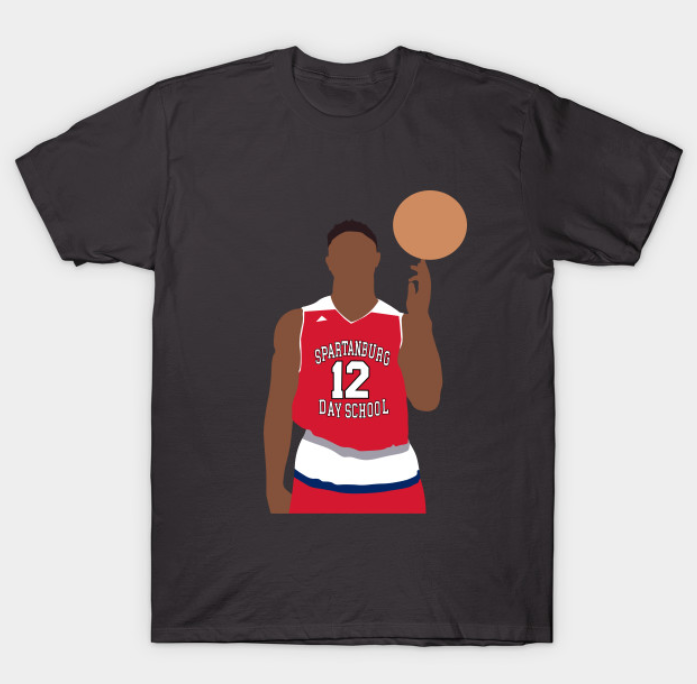 The tee is a cartoon Zion Williamson wearing his red and white Spartanburg High School spinning a ball on his huge index finger of his left hand. This Zion t-shirts features him in his high school basketball jersey and in black — the most popular color in this specific design. If black isn’t for you, then you have the choice of nearly 30 different color backgrounds to choose from. 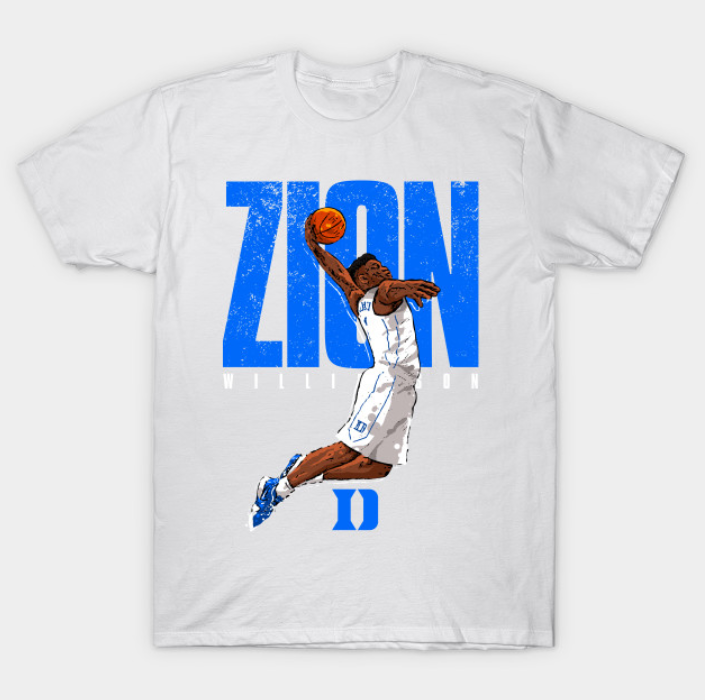 Check out the Zion Williamson high school jersey t-shirt at Teepublic.com. Last but not least, this Zion shirt plays off the real Mount Zion blending it perfectly with the Duke superstar’s name. See it on Amazon. This Zion t-shirt from Baller Culture comes in four colors where the “M” in Mt. is an drawing of the actual Mount Zion, while the “I” in “ZION” is simply Zion Williamson’s Duke jersey number. The shirt is a comfortable blend of 90% Cotton and 10% Polyester and you can buy the Mt. Zion shirt from Amazon. Didn’t find what you want above? 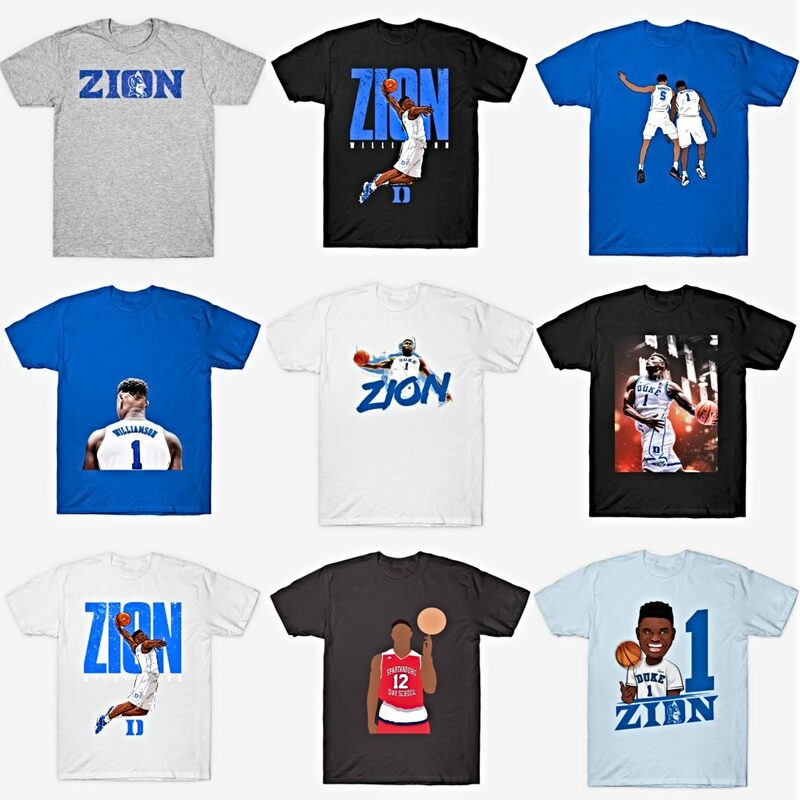 Check out all of Teepublic’s Zion Williamson’s shirts. 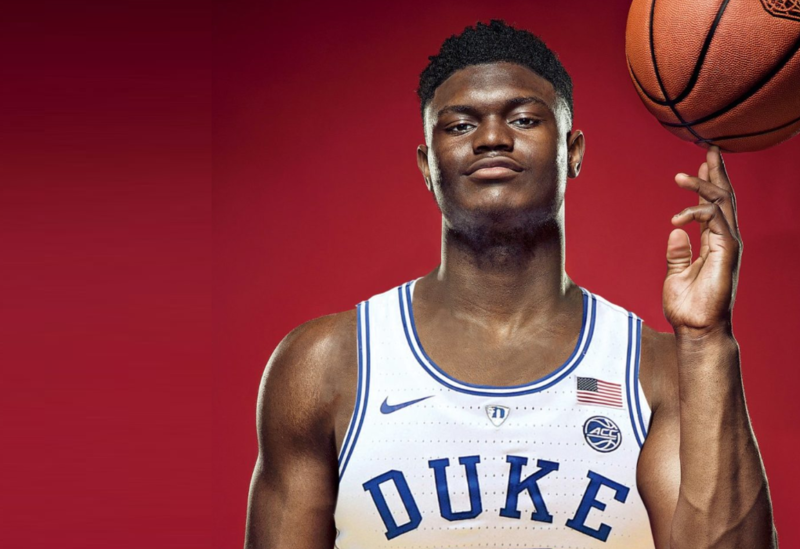 Not just a Zion fan but a Duke fan, check out our other article on the best Duke basketball gear to show off your passion and loyalty to not just Williamson, Barrett, but Coach K and the rest of the Duke organization as they move onto the Sweet Sixteen bracket of the 2019 NCAA tournament.